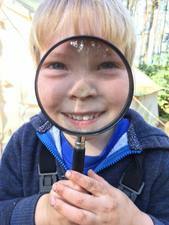 We are a small, family friendly service run by experienced and qualified staff with a passion for outdoor learning and early years education. Since we opened our invisible doors in January 2017 we have supported 11 children to grow, play and learn through a nature based pedagogy, fully compliant with Curriculum for Excellence. Children have come on in leaps and bounds, emotionally, cognitively and socially, building resilience, skills and knowledge to make them ready not just for school, but for life. We are currently open on Mondays and Tuesdays during PKC term time and have spaces on both days.